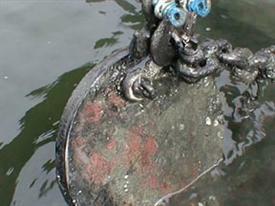 For one hundred forty years, harbormasters have relied on using a mushroom anchor for a permanent mooring. 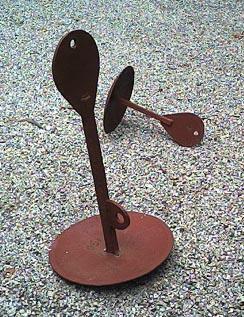 We sell U.S. made all steel mushroom moorings. Carbon steel has the property of bending rather than breaking and allows 100% welded construction.In addition they have the advantage of being counter weighting, a more aggressive biting edge,and a larger bell diameter that greatly improves holding power. The weighted head also boasts a larger eye insuring longer-life and the shaft will stay on the bottom keeping the chain from wrapping around it. 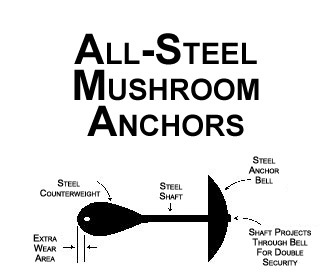 We have found that our anchors provide more holding power than a Pyramid and up to 25 percent more than a traditional cast iron mushroom.One of our anchors properly set will have a holding power of about 10 times the weight. Mooring eye on a 300lb mushroom being inspected after 6 years in water shows no sign of wear. Once you compare the choice is U.S.-Made Steel Mushrooms. 25lb,50lb,75lb,100lb Suitable for boats to 15 ft.
150lb,200lb,250lb Suitable for boats in the 15-25ft range. Also in 2001 a New short shank 150lb for shallow water.